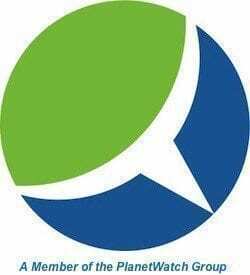 The number of Americans who believe global warming is happening is on the rise, according to a Brookings Institution report on the latest National Survey of American Public Opinion on Climate Change (NSAPOCC) survey conducted in December of 2011. The report shows much of that new-found belief comes from direct experience with independent studies showing that four out of five Americans have been directly impacted by climate change. 2011 was a “year for the record books” bringing record drought and heat waves, hurricanes, floods, winter storms and wildfires. 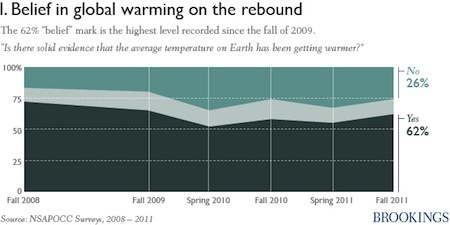 In all, there were 14 record climate and weather-related events in 2011, each causing at least $1 billion in damage. Hurricane Irene alone caused more than $7 billion in damages. Belief driven by local conditions can be fickle, but the study also cites reports of declining Arctic sea ice and melting ice sheets as driving public concern about changing climate. According to the latest NSAPOCC survey, 62 percent of Americans believe that global warming is real, more than at any time since 2009 when 65 percent held that belief. Public perception has changed significantly since the 2010 survey, when only 58 percent felt the evidence for global warming was compelling. Of course, for some, there is little that will sway their disbelief that global warming is occurring. Though the number of people denying climate change has dropped to 26 percent, those who are left are dug in, and mostly Republican. 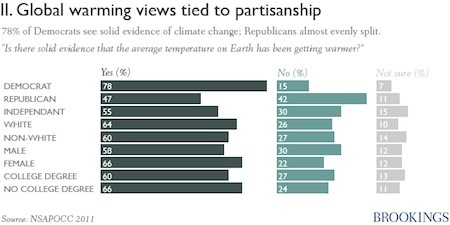 Only 47 percent of Republicans believe there is evidence of global warming, as opposed to nearly 80 percent for Democrats. Rabe said those who believe there is no evidence of climate change, though fewer in numbers, are highly certain in that belief. “On either side of the issue, both for and against, people tend to give a generally solid level of confidence,” he said. “That doesn’t mean there aren’t movers or people who can’t be changed,” Rabe added. Instead of approaching climate change as a “third rail” issue never to be touched except in its denial, some conservatives still call for a more sensible approach. Last year former Republican congressman Bob Ingles pleaded for his conservative colleagues to “return to true conservatism” in dealing with global warming. Whatever people choose to believe, and for whatever reason, extreme weather and climate events pay little heed. A swath of destructive, late-winter tornadoes tore through the U.S. midwest yesterday, killing at least 12 and injuring hundreds more, bringing back uncomfortable memories of last year’s record-breaking tornado season. Extreme weather events like those scene across the country last year and in the midwest yesterday, are quickly becoming part of the “new normal” all Americans can expect to experience more often in a warming world. The survey is essentially meaningless since it avoids the key question: whether warming is natural or man-made. Actually, there is no longer much question about that. The recent warming episode (ending 14 years ago) was well within the normal variations of the Holocene. Meanwhile, the Russians’ Vostok ice cores have effectively demolished the whole theory of man-made warming. Both the historic pattern and geopulsation theory indicate we are near the mid-peak of the present interglacial period — which will be followed by another Pleistocene glaciation, as has always been the case for the past million years or so (see Roots of Cataclysm, Algora Publ. NY 2009). The purpose, or “meaning,” of the multi-year study is to gauge the perceptions of Americans on global warming. It’s difficult for me to thus make the leap that the latest survey is therefore “meaningless,” even if it did “avoid” the question of natural vs. anthropogenic global warming – which it clearly does not. In fact, the survey specifically asks that question of resondants, as a quick scan of a summary of the survey results show. The study does what it sets out to do, and includes the concept of natural vs. man-made global warming. What you do get right is that there have been and always will be natural forcings to climate. The dismissal of anthropogenic forcings is misguided.